Now you can wear the KFJC Continuous Operation Statement on your back. Amaze your friends and mystify your enemies. 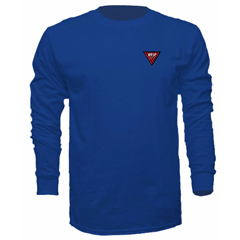 This 100% cotton, long-sleeved, blue t-shirt has the KFJC logo on the front and the full Continuous Operation Statement on the back. Is this the stuff dreams are made of, or what? KFJC BROADCASTS 24 HOURS A DAY ON AN ASSIGNED CARRIER FREQUENCY OF 89.7 MEGAHERTZ, CHANNEL 209. KFJC BROADCASTS WITH AN EFFECTIVE RADIATED POWER OF 108 WATTS. KFJC STUDIOS AND OFFICES ARE LOCATED IN BUILDING 6200 ON THE FOOTHILL COLLEGE CAMPUS, WITH TRANSMITTER LOCATED HIGH ATOP BLACK MOUNTAIN, OVERLOOKING THE SANTA CLARA VALLEY. SERVING THE COMMUNITIES OF THE ENTIRE BAY AREA, BROADCASTING FROM FOOTHILL COLLEGE, THIS IS KFJC, LOS ALTOS HILLS. 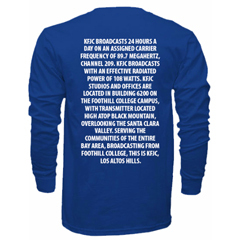 The KFJC ContOp Long Sleeve is available as our thanks for your generous donation of $45.00 or more.